When BusinessWest launched its Forty Under 40 program in 2007, it did so to identify rising stars across our region — individuals who were excelling in business and through involvement within the community — and celebrate their accomplishments. Today, BusinessWest is announcing a new award, one that builds on the foundation upon which 40 Under Forty was created. To nominate someone for this award, go HERE. To review an honoree’s profile piece from the year they were honored go HERE. It’s called the Continued Excellence Award. Sponsored by Northwestern Mutual, this honor, as the name suggests, will be presented to the individual who, in the eyes of a panel of three judges, has most impressively continued and built upon the track record of accomplishment that earned them 40 Under Forty status. 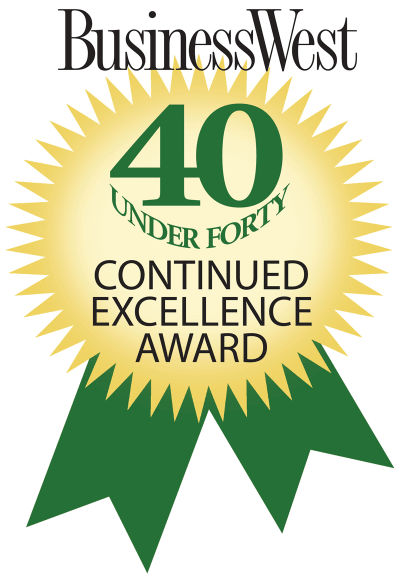 The award will be presented at this year’s 40 Under Forty Gala on June 18 at the Log Cabin Banquet & Meeting House, and will providing a fitting climax to what is always a memorable evening. This will be a nomination-driven process, with nominations due to BusinessWest by 5 p.m. on May 22. Eligible candidates are those from all eight 40 Under Forty classes prior to the current year. • How the candidate has been able to inspire others through his or her work. The judges will first narrow the field of nominees to five candidates, who will be informed that they are finalists for the coveted honor — an accomplishment in itself. The judges will then choose a winner; the identity of whom will not be known to anyone but the judges until the night of the event. Kate Campiti, associate publisher of BusinessWest, said the award was created to recognize those who have taken already-impressive résumés — it takes one of those to become a 40 Under Forty honoree — and committed themselves to add new lines to it. Kate Kane, managing director of the Springfield office of Northwestern Mutual, presenting sponsor of this year’s 40 Under Forty program and this new award, agreed. While doing all that, the new award will certainly build upon the excitement and prestige of the 40 Under Forty program, and add still another level of suspense to what is already one of the best-attended and most anticipated events of the year.